Barack Obama presented a vision of the future to the American people, and they responded. Through his policies, through his rhetoric, through the symbolism of his own candidacy, Barack Obama inspired a sea-change in US politics. As Israel approaches its own General Elections, and as the candidates present themselves and their own approaches to the people, it is increasingly clear that no one is yet offering an inspiring and hopeful vision of the future. What should be the next Prime Minister’s vision for Israel? What vision for the future might inspire not only Israel, but the entire Jewish world? There is no doubt that Israel and Jews around the world have the potential to make a significant collective contribution to the world – what should the next Israeli Prime Minister say and do in order to harness and galvanize this potential? 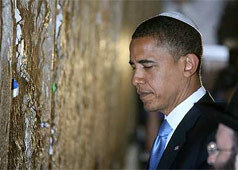 Where is the Israeli Barack Obama?